Imagine if you could see deep into the future. And way back into the past, both at the same time. Imagine having visibility of everything that had ever happened and everything that was ever going to happen, everywhere, all at once. And then imagine processing power strong enough to make sense of all this data in every language and in every dimension. Unless you’ve achieved that digital data nirvana (and you haven’t told the rest of us), you’re going to have some unknowns in your world. In the world of security, unknown threats exist outside the enterprise in the form of malicious actors, state-sponsored attacks and malware that moves fast and destroys everything it touches. The unknown exists inside the enterprise in the form of insider threat from rogue employees or careless contractors – which was deemed by 24% of our survey respondents to pose the most serious risk to their organizations. The unknown exists in the form of new devices, new cloud applications, and new data. The unknown is what keeps CISOs, what keeps you, up at night – and we know because we asked you. 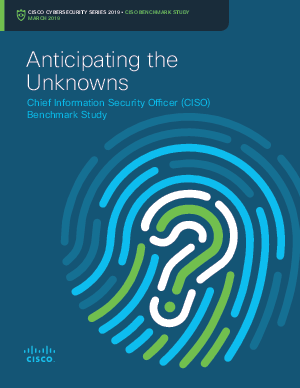 Download this asset to learn more about Cisco's CISO benchmark study today.